Just as Microsoft gets done releasing those 3D, photo renditions of major cities on its Live Search Maps, in comes Google to shake the competition up a bit. 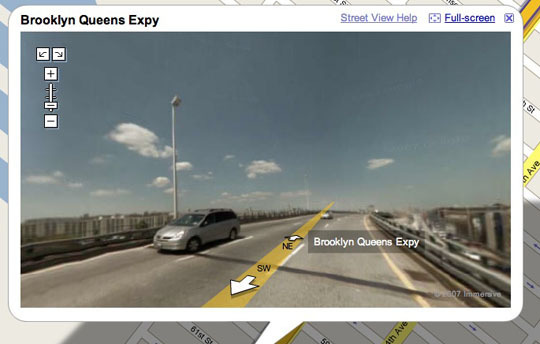 This new street view Google is offering is only available in parts of NYC, San Francisco, Denver, Las Vegas, and Miami. Of course in time, most major cities and eventually all of the world will be available at street level. The interface looks pretty decent and conveniently offers the ability to zoom in on objects and look all around you. It’s worth mentioning that the streets are labeled and show which direction they run – extremely useful if you’re trying to get a feel for foreign territory. Bust a move over to maps.google.com and give it a spin.